Can Compression Socks Help To Keep Your Golf Game Under Par? Similar to other leisure and sports activities such as running or biking high level performers can also turn golfing into a professional sport. For novice or semi-skilled golfers, who are by no means less passionate about it, teeing off and enjoying the game in the beautiful settings of the golf courses is simply part of their life style without the feel of high stakes competitions. Whether you are playing professional or just for fun, unlike cycling or running the game of golf by nature involves long periods of nearly motionless standing and sitting over the course of a match especially if you are traversing the green in a golf cart. During such inactivity the blood circulation has a tendency to slow down because of the absence of the calf muscle action, which acts like an auxiliary pump in the leg while walking, by rhythmically squeezing the leg veins and thereby helping to push the blood along back to the heart and lungs. In addition, the downward force of gravity and potential venous issues such as defective valves inside the veins or varicose veins can also be inhibiting factors for less than optimal blood circulation. The slowing of the blood flow can manifest itself as heavy and tired feeling legs. In worse cases this can also lead to pooling of blood and fluid in the legs and feet accompanied by swelling and the risk of deep vein thrombosis (formation of blood clots). Without any corrective treatment measures long term effects such as skin tissue deterioration and ultimately skin ulcerations are possible as well. Compression flight socks or travel socks as well as compression socks for golfers are designed to prevent tired and achy feelings in the legs and to help boost blood circulation. Much different from conventional socks compression socks feature graduated compression. This means that specific amounts of pressure (measured in mmHg) are applied to different areas of the leg. The highest compression pressure is applied starting at the ankle area. From there the pressure gradually decreases as you go up the leg to just below the bend of the knee. 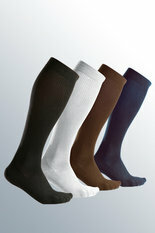 Compression socks can be worn during strenuous professional or recreational sports performance. Both professional athletes as well as amateurs have stated that wearing compression socks or stockings actually improved their endurance and stamina. Many sports enthusiasts also swear by the benefits of compression socks for a speedier recovery after a competition or training. Whether you are a pro golfer or just a beginner staying the course through the ever changing terrain conditions of an 18 hole match can make even the most healthy legs and feet feeling fatigued and achy. Wearing compression socks may just be the lift you need to keep your legs more energized and pain free for increased performance during your golf game and afterwards for a speedier recovery from the strain of the game. Before you decide to hit the green with compression socks make sure to get the green light from your physician first to ensure that there are no underlying conditions that would preclude you from wearing compression stockings. See also our post… When are Compression Stockings and Compression Therapy NOT of any Benefit or even DANGEROUS to your Health?